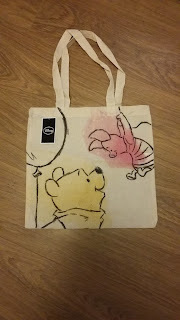 Drum roll please ..................... this month, I am giving away a brand new wee Disney totebag featuring Winnie the Pooh and Piglet as pictured below. As always, the competition will run until the end of the month, enter using the Rafflecopter below, the more entries you complete the more times you name goes into the draw. Open worldwide, as always thanks for stopping by, sharing the reviews, links, commenting and recommending great books. I know a little girl who would love that bag! In answer to your what are you reading question - Round Ireland in Low Gear by Eric Newby – bought from a second hand book shop in Northern Ireland. I've recently got round to reading American Psycho! I'm re-reading the OUTLANDER series. Currently reading Frailty by Betsy Freeman Reavley. Im.reading a Buddhist book. Im.hoping it will help.with my anxiety. I'm halfway through Bernard Cornwell's The Flame Bearer, love this series! Harry Potter and the Cursed Child and without giving any spoilers to anyone who hasnt read it - I'm disappointed! Let the Right one in....however I had a new baby three weeks ago amd have not had much time to read since. Chris Carter's The Night Stalker, my favourite book by my favourite author. On about the 5th copy of it now. Love this Tote bag. Thank you for running such a generous giveaway! I just finished half a yellow sun - it was amazing!